Even before last season ended, one Seahawk’s name was on everybody’s watch list for the 2009 season. Matt Hasselbeck played in only a handful of games last year due to severe injury, but is says he is better now. · The new coaching staff came out and said they will be critical to get the best out of their stars. · Also, the new staff uses peer-to-peer ridicule, but praises their players just as frequently or even more so. · Currently, the team is installing the entire playbook and then the coaching staff will figure out what best suits the team’s starters for the 2009 season. · Hasselbeck is still learning about TJ Houshmandzadeh and what kind of a wide receiver he is. · As a big and strong wideout, Houshmandzadeh has tricks to get open and Hasselbeck said he has to continue to get used to those tricks in order to get quality plays created. 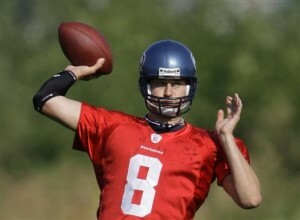 To listen to the interview with the Seahawks’ starting quarterback, click here. The Seahawks begin the 2009 preseason this Saturday when they play at San Diego.